Medical expertise delivered to your home. With a Registered Nurse and Doctor on staff, our highly skilled nursing team is available to assist you. We specialize in caring for seniors who need assistance with medical conditions, or simply need a hand around the house. Our company is Medicaid certified and offers 24/7 care as needed. We are always looking for qualified caregivers who truly love caring for others. We offer a fast paced work environment with competitive compensation with the opportunity to care for others in the comfort of their own home. 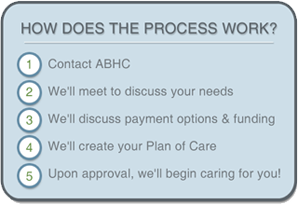 Above & Beyond HomeCare, Inc. is a home health care company that is passionate about caring for those in need. Based in Anderson, Indiana , we offer homecare throughout Indiana. We are Medicaid certified, and work closely with our patients to ensure they understand their payment options and potential sources of billing assistance. Have questions? Fill out the form below and we'll contact you.